NIU law students stand outside the Zeke Giorgi Legal Clinic in Rockford. 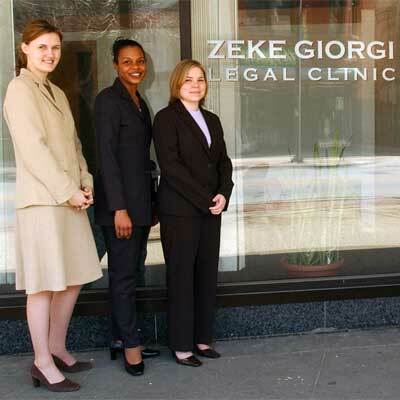 The NIU College of Law’s Zeke Giorgi Legal Clinic has been changing lives for a decade, both for the clients it serves and the students who work there. The clinic marked its 10th anniversary by hosting an event Wednesday, Nov. 16, that included Mike Madigan, speaker of the Illinois House of Representatives. Madigan was a protégé of the clinic’s namesake, E.J. “Zeke” Giorgi, the longtime Rock River Valley legislator (1965-1993) who was instrumental in bringing the College of Law to NIU. Opened in the fall of 2001, the clinic provides third-year law students the opportunity to practice law under the supervision of experienced attorneys, learning lessons that cannot be found in textbooks. Since opening, the clinic has enrolled 274 students who have worked on more than 2,000 cases. Mostly of the work they do is on behalf of the elderly or victims of abuse. One thing all of the clients have in common is that without the clinic they could not afford legal representation. “People come to us because they have nowhere else to go,” says clinical associate professor Paul Cain, who has overseen students at the clinic for eight years, watching them undergo the transformation from nervous law students to soon-to-be lawyers. Along the way, students also gain the realization that the outcome of a case can have a profound impact on the life of a client. Sometimes their services can even be life saving, says Karen Gill, vice president of Remedies Renewing Lives, a domestic violence shelter and services program serving Rockford and Belvidere. For their help in such instances, Gill nominated the clinic for the Partner in Peace Award, which the clinic received in 2010. Helping clients in such situations is not always a simple matter, which is where Cain, and clinical assistant professor Wendy Vaughn, figure into the equation. The two work alongside each of the law students throughout each case, reviewing documents, offering advice, sitting in on interviews and having students rehearse courtroom presentations again and again. That oversight and the light caseload that students carry (five or six cases a semester, as compared to maybe 200 cases at any given time for a public defender) helps the clinic maintain a very high success rate, Cain says. Still, even with that that kind of support, it is nerve-racking to stand in front of a judge for the first time, says Sara Cavanagh a 2003 graduate of NIU-Law who vividly remembers that experience when she served at the clinic. Nerves aside, the experience she gained was invaluable. “I got to interview clients, write memoranda, appear in court – it taught me the basics of things I still do every day. That real life experience made the clinic my favorite part of law school,” Cavanaugh says. She also found affirmation that she had chosen the correct career path. 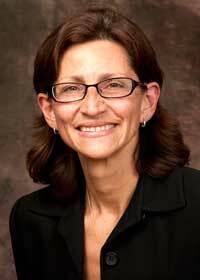 “One of my first cases was drafting a will for a woman with some health issues. It felt like I was actually helping someone – and it reaffirmed for me why I wanted to practice law,” says Cavanagh, who currently works in the Winnebago County State’s Attorney’s Office. Many students leave the clinic with a similar sentiment, as well as a greater appreciation for the important roles a lawyer can play for a client, Rosato says. It also improves the students’ job prospects. 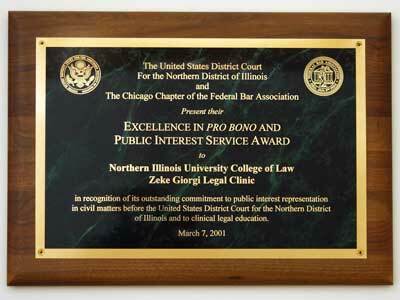 The NIU College of Law offers a number of other opportunities for hands-on learning such as internships and externships, but nothing compares to the comprehensive experience that students get at the Zeke Giorgi clinic.